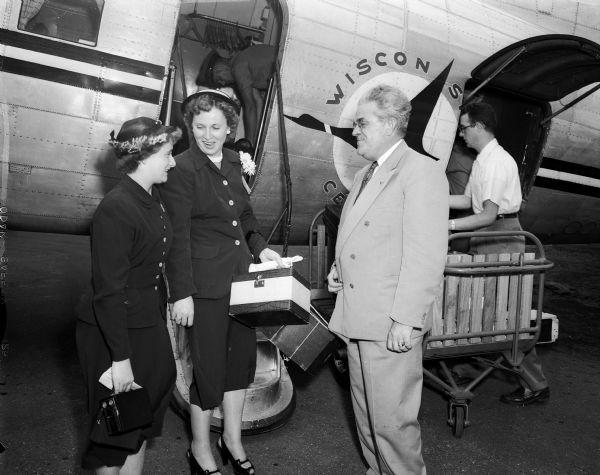 Bonnie Wainscott (left), age 16, and her mother Mrs. Grace Wainscott are greeted by Francis M. Higgins, President of Wisconsin Central Airlines. The Wainscotts appeared on Tommy Bartlett's "Welcome Traveler" program in Chicago and a visit to Madison was arranged through the Wisconsin Central Airlines and the Edgewater Hotel. Bonnie was stricken with polio when she was 13 months old and Mrs. Higgins was a polio victim in 1907. Photo published in Wisconsin State Journal Aug. 3, 1951.